Need a replacement Maryland Boating Safety Education Card? 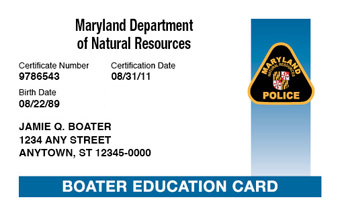 If you have lost or damaged your Maryland Boating Safety Card and would like to order a replacement card, simply contact our friendly BOATERexam.com® agents directly at 1-(866)-764-2628 or email [email protected]. Faulty cards will be replaced at no charge (provided you return the faulty card). Lost or damaged cards will be replaced for a fee of $9.95, including shipping. NOTE: We can only issue replacement cards if you have completed your online boating safety course with BOATERexam.com®. The boater education card is proof that you have successfully completed a boating safety course. The boater education card does not expire and does not need to be renewed. Therefore, it is NOT a Maryland Boating License!